After a four year hiatus, Duelist Packs return to the Yu-Gi-Oh! TRADING CARD GAME with the biggest set ever assembled in Duelist Pack: Battle City! Based on the famous Battle City story arc from the classic Yu-Gi-Oh! 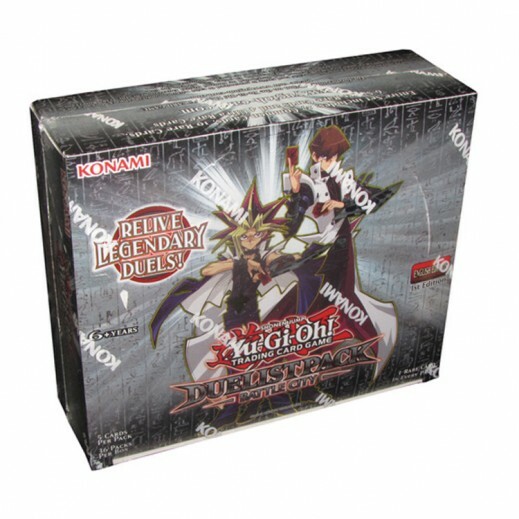 animated TV series, Duelist Pack: Battle City contains brand new cards plus classic favorites!This huge, 47-card Duelist Pack set includes cards used by several characters from the show, like Yugi, Joey, Kaiba, Bakura, and Marik, as well as brand new cards, making them instant 'must-haves' for everyDuelist's collection. These exciting cards are mixed with other favorites like Red-Eyes B. Dragon, Blue-Eyes White Dragon, and more, making it even easier to collect these for your very own!